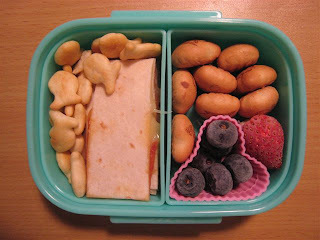 Of course, the kids had to use the new Disney store bentos. I, in a not so brilliant moment, ran out of bread. And fruit. And, well, lots of other stuff. Thankfully, in a more brilliant moment this summer, I bought tons of blueberries, blackberries & strawberries and froze them. That solved the fruit dilemma. And, it's always a good day for quesadillas. We had tortillas, not bread. 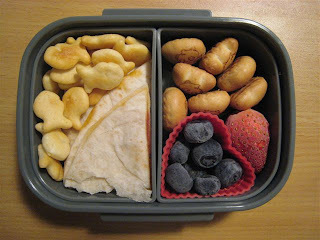 Both kids had the same lunch--pizza quesadillas (I'm kind of out of meat too), some goldfish crackers, panda cookies, blueberries & a strawberry. In case you were wondering, the fruit is fine, it was just still frozen when I took the pictures!